La bibliothèque, rénovée entre mai et octobre 2016, a été inaugurée en novembre 2016. Elle est désormais ouverte 24h/24, 7j/7. La communauté HEC y accéde avec un badge . Découvrez également la bibliothèque rénovée sur notre vidéo. HEC library is in need of an update and as from May 30th, workers will begin the process of bringing a more modern and efficient interior space to the library. During that period, a temporary library will be open in I Building. The library facelift aims to transform the spaces to create new collaborative facilities for students and faculty. The academic commons will continue to have different forms of print but patrons will also have access to more study rooms and meeting spaces. We won’t eliminate spots for quiet, individual study, but the renovated spaces will include more opportunities for working on group projects. We’ll have new layout of books, walls and doorways will be removed or added to create new rooms, all public areas of the library will be painted, a new carpet installed and the lighting system will be retrofitted with energy-efficient fixtures. The desk will have a new look and feel and will be the single point for user interaction. Besides, a new “Lounge” area across the desk will host magazines, newspapers, video collections as well as tablets and iPads. Most of the spaces will be flexible for learning and teaching spaces. They will be equipped with technological features (monitors, videoconference equipments…) and furniture that supports and reflects different learning and teaching styles, as well as blended learning and self-learning. The plan is to renovate the entire interior of the library and the new layout will make the library much more accessible with brand new furniture, great fabrics and colors. We believe students will be very impressed upon seeing the results of the renovation. It will give the library a modern and fresh look and hopefully, patrons will want to go in, study, read and do projects. 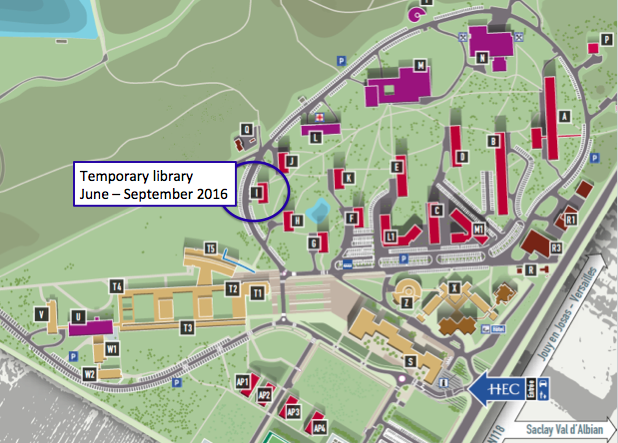 During the works period, a Temporary Library will be open in Building I (see map below), where librarians will provide research assistance, textbooks loan and access to financial databases. Temporary Library in Building I, open from 9am to 6pm. Books will be to return to Building I. Access to books will be limited there, so try to pick up what you need by 28th May! L’opération de rénovation de la bibliothèque nécessite de faire de la place ! Des milliers de livres vont être stockés dans les archives de la bibliothèque au sous-sol et seront désormais disponibles sur demande. Par ailleurs, de nombreux livres, qui n’étaient pas catalogués dans notre catalogue Flora sont actuellement “désherbés”. La plupart sont disponibles via le Sudoc et dans de grandes bibliothèques parisiennes. Venez en découvrir une sélection, renouvelée chaque jour, dans le corner “Cabinet de curiosités” spécialement aménagé dans la salle de gestion de la bibliothèque. Surprenant, parfois déroutant ou inspirant… mais toujours intéressant ! We recently asked you to express yourself on your expectations for a renovated library. Thank you for having answered our quick survey. Whiteboards, cosy furniture, coffee machines, better air circulation, better lighting indoor, more computers, bigger tables, comfortable reading chairs. All your valuable input are now part of the project. Thanks to everyone! Later this year, the library will kick off a renovation project and transform many areas of the library into brand new spaces that support the technology and the activity you asked for. This site will be a useful tool to get updates of what’s happening, from the project to the preliminary renderings. You will be able to share your comments on every step of the project (see also the result of the kick off survey).